Home | Acity Life | Instant boiling water taps! The Boiling water tap has taken kitchens by storm, becoming ever increasingly popular due to their simplicity, efficiency and speed. Boiling water taps are incredibly handy, instant boiling water at the twist of the tap, whenever you want! Not only that, they save both energy and water. Most boiling water taps enable you to have the exact amount of boiling water you need without wastage. You no longer need to run the tap for ages to get warm water so you will see the benefit in your monthly energy bills. With instant access to 100°C water, energy efficiency and money-saving thanks to the lack of wastage and heat up times and 100% safety guaranteed, these multi-purpose taps are the perfect choice for any kitchen. As they say, every little helps. Helps your pockets and the environment! As well as being efficient, they look incredibly sleek in any modern kitchen, adding the finishing touches necessary to make your kitchen ooze style. They eliminate the need for a kettle clogging up the work top (we all get annoyed with how unsightly they can make the work tops), they eliminate the need to keep refilling the kettle, meaning you can add instant boiling water to vegetables and pasta PLUS make your perfect cup of tea or coffee with the touch of button. No waiting for what feels like forever whilst the kettle is boiling. You can have your ideal brew completed within seconds. Perfect! Especially first thing in the morning when a brew is everything you want and need to start the day! Because you can get boiling water taps that offer 100°C instant water, they become incredibly handy for sterilising things like baby bottles, protein shakers, animal food bowls and general sanitation. They really are the ideal addition to any family home. We sell taps by top brands Quooker and Franke. Both brands are popular for different reasons and within their own rights. Also, both brands have similar tap functions with varying designs and finishes to suit any and every kitchen. Let’s make a start with Quooker. 100°C boiling, hot, cold and now also cold filtered drinking water, the Quooker tap really does do it all. Quooker say it’s ‘a true revolution’ and the new kitchen must have. The tap that immediately dispenses boiling water. Tap on the work top, tank underneath, a Dutch invention that is taking over the kitchen world. There is plenty of choice when choosing Quooker. You can choose between a separate boiling water tap with accompanying mixer tap, or the Quooker Flex or Fusion models; a single tap for hot, cold and boiling water. Ultra-safe, super-efficient and available in eight tap designs and three finishes. The beauty of Quooker taps is their lack of waste. The patented high-vacuum insulation ensures that the Quooker’s standby usage is just a fantastic 3 pence a day! Just 3 pence! That’s amazing, isn’t it?! For even more efficiency, choose a COMBI tank, a single, amazingly economical way to produce both hot and boiling water. By generating both hot and boiling water in a single compact tank under your worktop, the Combi eliminates the need to pipe hot water all the way from the main boiler to the kitchen sink. Therefore, no longer having to run the tap for ages to get warm water for washing dishes or filling pans! If safety is something of importance in your kitchen (I mean it is, but if you have little hands adding that extra worry, it can be more so) Quooker taps have a childproof handle and insulated sides that ensure it never feels hot to touch. The water is boiling; however, the flow of water is a fine spray rather than a solid jet, giving you plenty of time to get your hands out of harm’s way. Also, the boiling water control is entirely separate from the standard hot and cold. 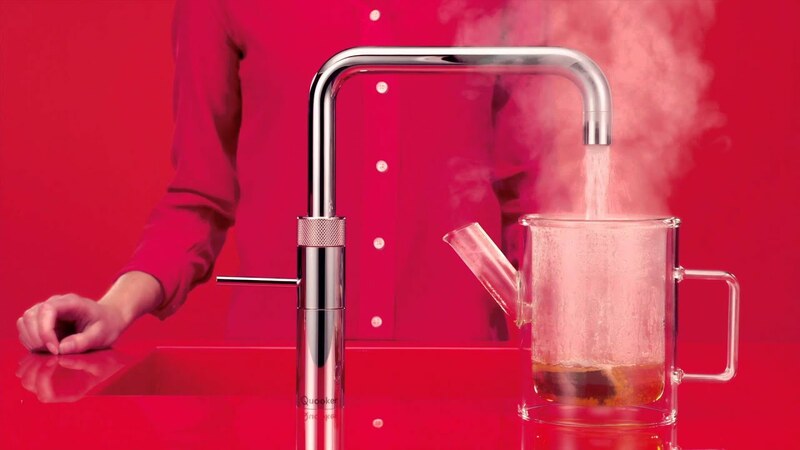 The Quooker Flex boiling water tap has a flexible pull out hose. 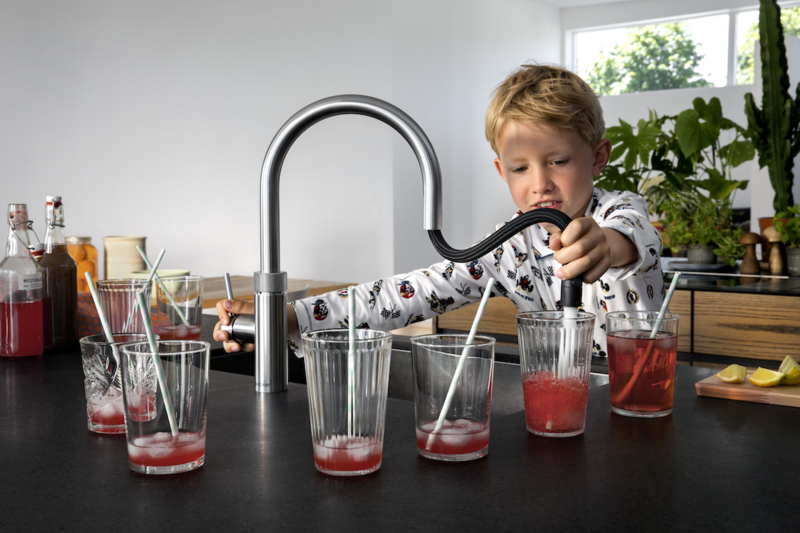 The Flex is the latest tap innovation from Quooker. A stunning boiling water tap, equipped with a flexible pull out hose to reach all those awkward corners of your skink! This hose is for hot, cold and cold filtered water, making it easier to rinse, clean and fill. Mentioning safety previously, the Flex will not dispense boiling water when the pull-out hose is pulled out, so you needn’t worry about little hands pulling on the hose and scolding themselves or others! The Flex is available in a round style and can be finished in polished chrome or true stainless steel. This tap is also available with a cold-water filter option built-in to the push and turn function. Versatile! Quooker’s newest innovation, the Fusion tap, is a single tap which unites both mixer and boiling water functions. This kind of tap is convenient, space saving and sleek in its design. Incorporating a childproof double push and turn handle with light ring, to ensure there are no accidents where your tap is concerned. Available in both square and round spout style variations and finished in chrome, brushed chrome and stainless steel, there is a Fusion for everyone. Quooker have two types of tanks available. The PRO tanks ensure that you always have access to boiling water, while the Combi offers both boiling and hot water. Each Quooker tank features their patented high-vacuum technology to ensure the standby usage is just 3 pence per day. The cold-water filter has been designed to allow you to quickly switch from tap water to cold filtered water. 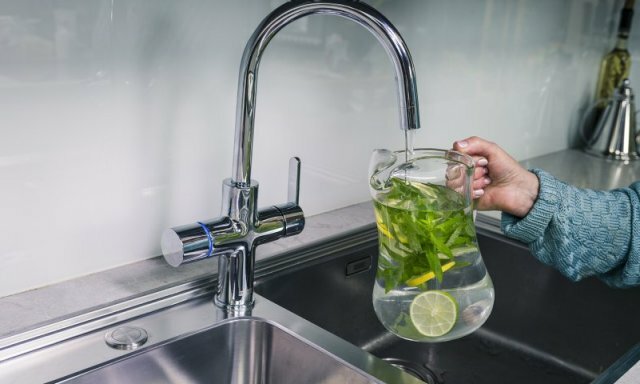 Regardless of which Quooker tap you choose, the taps are now able to supply cold filtered water via a single push and turn which when engaged will light the tap ring blue. The water passes through the activated carbon filter which ensures the water tastes and smells better than anything you will have had before. Quooker developed scale control to lengthen the lifespan of your tap by reducing water hardness. It is the most reliable descaling solution for the Quooker and improves the taste of your water. Now, let’s get on to Franke. 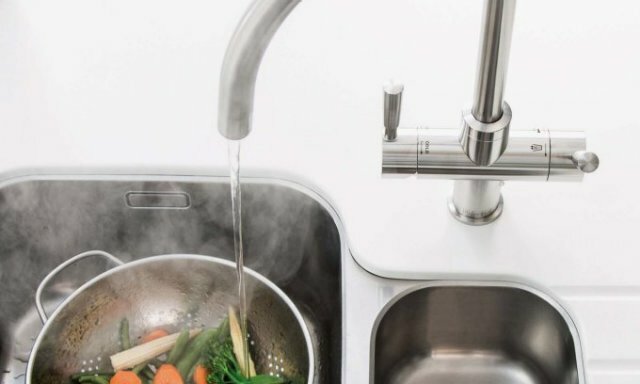 Instant boiling water taps are the ultimate kitchen companion. They eliminate the need for a kettle taking up work top space. They enable you to cook vegetables, create pasta dishes, make tea or coffee instantly and sterilise baby bottles with 100°C boiling water available at the touch of a button. Franke boiling water taps offer hot, cold and instant 100°C boiling water to save time, energy and water in a single, stylish, convenient and space-saving unit. The new Minerva 4-in-1 instant boiling water tap from Franke is the one tap that delivers not only hot and cold mains water but also cold and boiling filtered water too. Don’t forget, it’s not nearly boiling water like many kettle taps, it’s really boiling at a full and impressive 100°C. Nothing less will do to quicken up cooking and brew the perfect cup of tea! Franke have designed the Minerva to offer fast and intuitive access to the four water options, a separate electronic dial dispenses the instant filtered 100°C boiling water and filtered cold water, while standard mains hot and cold water are operated by a single lever, much like a normal single tap. Available in both round and square spout styles, and finished in chrome and stainless steel, you are sure to find a Minerva to suit your kitchen design. The Omni 4-in-1 tap delivers not only hot and cold mains water but also cold and 100°C boiling filtered water, marrying the timeless appeal of a swan-neck spout and elegant levels. All Omni taps have a premium hi-shine finish. One tap does all! The Omni taps are available in classic and contemporary spout styles and a range of new coloured finishes; stainless steel, black, gold and copper, to complement the growing trend for coloured metals in today’s modern kitchen designs. Are you going to join the boiling water tap trend? Just think of how easy life will become if you invest in one! We have the Quooker Flex in our office so we know first-hand how practical, space saving and efficient they are! With the amount of teas and coffees made here daily, can you imagine how much effort and time would be wasted boiling a kettle?! We don’t have time for that! We also have outstanding lines of cooking appliances, refrigerators, including our American-Style fridge freezers as well as small appliances that make your life easier. De Dietrich.. Twist. Click. Cook. Quooker: an exciting choice for your kitchen!